The Turkish lira, which sank some 16% on Friday, to hit another record-low. The currency fell by as much as 10% in overnight trade to hit a low of 7.1326 against the U.S. dollar, before briefly paring some losses to trade at 6.8657, still down 7.3% for the day (). The lira after Turkey’s central bank and cut reserve requirements for Turkish banks. The moves will free up 10 billion lira, $6 billion, and $3 billion equivalent of gold liquidity in the financial system, the bank said. The central bank’s statement came after Finance Minister Berat Albayrak – who is President Tayyip Erdogan’s son-in-law – said Turkey would start implementing an to ease investor concerns, without giving details on what the steps would be. 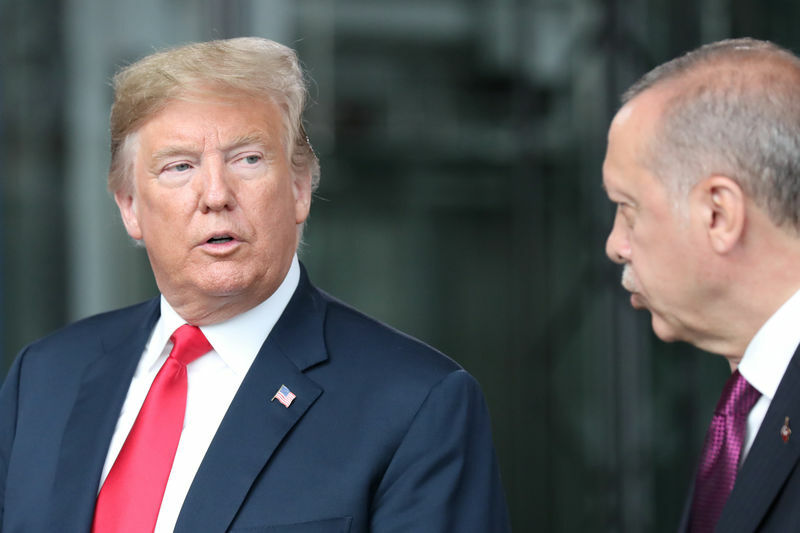 The Turkish lira has lost almost 50% of its value this year, largely over worries about Erdogan’s growing influence over the economy, his repeated calls for lower interest rates in the face of high inflation and worsening ties with the United States. Other emerging market currencies , as Turkey’s economic crisis escalated, and fears spread that it will spill over to the parts of the globe. South Africa’s fell 3% against the dollar to 14.4691. It tumbled more than 10% in earlier trading to a two-year low of 15.4645. Russia’s declined to its lowest level since mid-April 2016 against the dollar as falling oil prices and concerns over the impact of a fresh round of U.S. sanctions weighed. India’s rupee hit a record low against the U.S. currency, with climbing to 69.813. The and were also caught in the crossfire. The U.S. dollar climbed to a 13-month high, as the falling lira fueled demand for safe havens. The , which measures the greenback against a basket of currencies, was a shade higher at 96.30, after climbing to its highest since early June 27, 2017 at 96.39 earlier. The and Swiss were also well-supported. The euro, on the other hand, , with down 0.2% at 1.1388 after touching a low of 1.1365 earlier. The pound was wallowing near its lowest levels since June 2017, with at 1.2760, pressured lower by the stronger dollar and fears over the growing prospect of a ‘no-deal’ Brexit. Away from currencies, global stocks slipped to a one-month low, as a renewed rout in the Turkish lira weighed on appetite for riskier assets and drove demand for safe harbors. , with all sectors recording steep drops, as the fallout from Friday’s plunge in Turkish asset prices made its way across the Pacific. ended down around 2% to lead declines in the region, with the yen up as much as 0.5% against other major currencies. Several emerging markets were also dragged lower amid the jitters, with stocks in and the faring the worst, down some 3.6% and 2.2% respectively. The gloomy mood carried over to Europe, where banks dragged the region’s major bourses to a , as a growing economic crisis in Turkey shook investor confidence in lenders exposed to the country. On Wall Street, U.S. stock futures looked set to kick off the week on the backfoot, with the major indices on track to . The blue-chip were down 85 points, or around 0.4%, at 5:45AM ET, the shed 9 points, or around 0.3%, while the tech-heavy indicated a loss of 27 points, or roughly 0.4%. In commodity markets, gold prices traded lower, with spot prices , as the yellow metal found little in the way of safety flows, with investors opting instead to pile in to the U.S. dollar, Swiss franc and Japanese yen. fell $8.50, or 0.7%, to $1,203.40, just off an intraday low of $1,202.98, its lowest level since March 2017. A stronger greenback makes the dollar-denominated metal more expensive for holders of foreign currencies.